Tech Tip - Apple WiFi not automatically reconnecting to Preferred Networks? We've got your Fix! Working on Macs is supposed to be easy right? I mean that's what all the marketing hype seems to indicate. Get a Mac, all your computer problems go away. At least, I'm sure that's what all the folks at the jam-packed "Genius" Bar thought at the time of purchase. At least here in Los Angeles, that seems to be the prevailing belief. Mac good. PC bad. Now in general, getting and keeping that shiny little piece of half-eaten fruit connected to your wireless network is a snap. You turn it on, it detects networks, you pick one, put in the password, and bada-bing, you're online. But what happens when for no apparent reason, this relatively basic function just ceases to function? Now if most of the time you can still get it connected, but the computer just refuses to reconnect automatically, no amount of zapping the PRAM or repairing disk permissions is going to get this bad boy working properly again. What you're going to do is dig into those vaunted ",plist" files. Now what I generally do is remove the network I'm not automatically reconnecting to first. 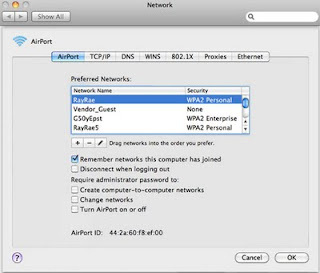 You'll need to go to your System Preferences, select network, choose your airport card, and then go to the advanced settings to a screen like this: Select the network that isn't being automatically reconnected to and click the "-" symbol. Now where going to get rid of the corrupt .plist files that are the likely culprits with your WiFi dilemma. Now just as a general warning, .plist files are configuration files for your Mac so as with the Windows registry, mess with these at your own risk. Now you're going to navigate to ~/Library/Preferences (~ signifies your home directory) and delete com.apple.internetconfigpriv.plist and com.apple.internetconfig.plist files. Then navigate to ~/Library/Preferences/SystemConfiguration/ and delete all the files therein and reboot. Upon reboot, your Mac will recreate these files and you should be up and running. Rejoin your preferred WiFi network and it should be smooth sailing from there on out. Ah Macs, aren't they perfect? Now if only they could make the wait at the genius bar shorter!